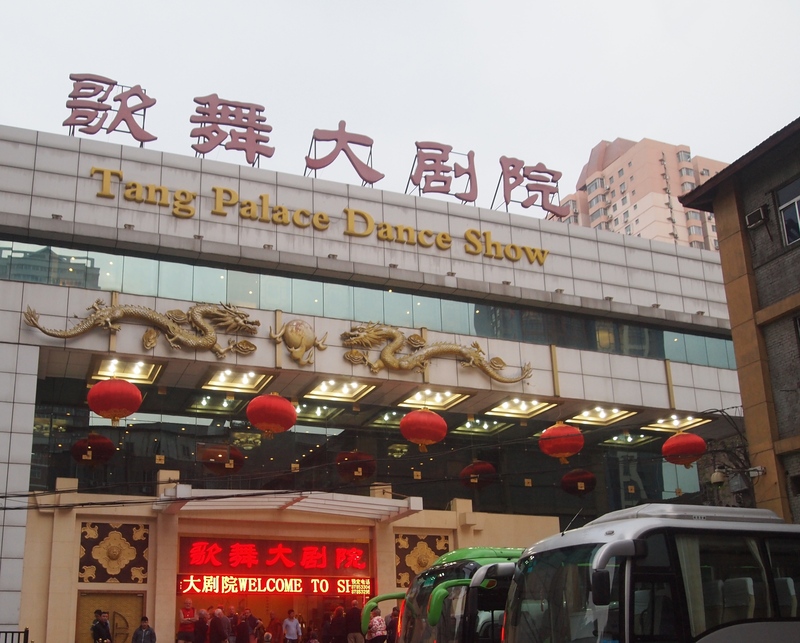 Monday, April 20: This evening, I go with Mari, the Finnish lady I met on our tour of the Terra Cotta Warriors, to the Tang Dynasty Palace to see a music and dance show. 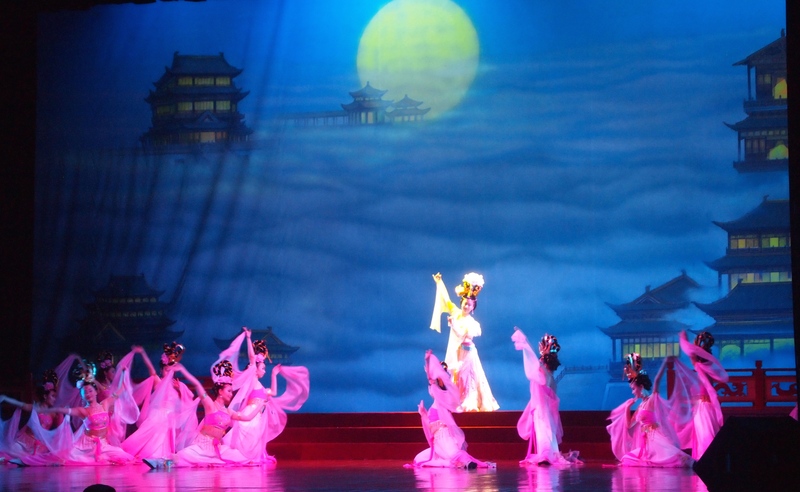 Since it was established in 1988, the Tang Dynasty Palace and the Shaanxi Provincial Song & Dance Troupe have cooperated to stage the Tang Dynasty Music and Dance Show. 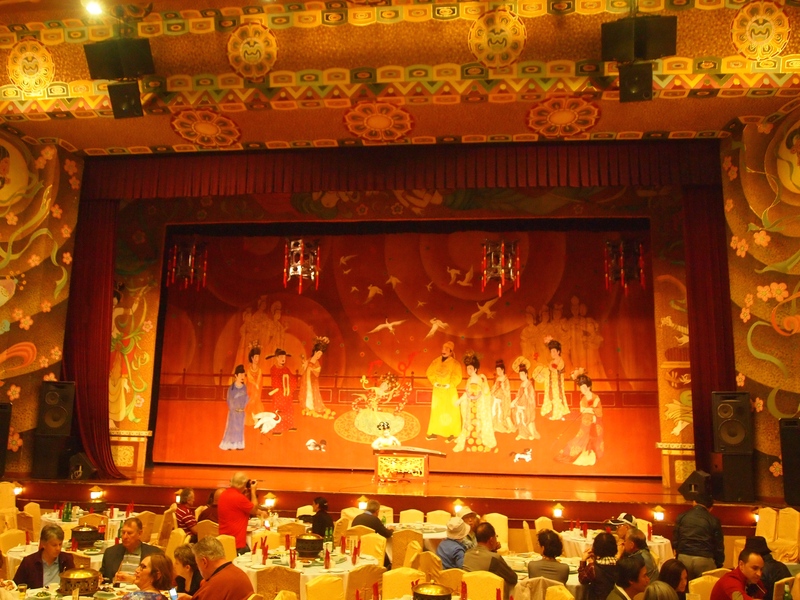 The venue holds about 650 diners who are served a variety of dumplings and other Chinese dishes. 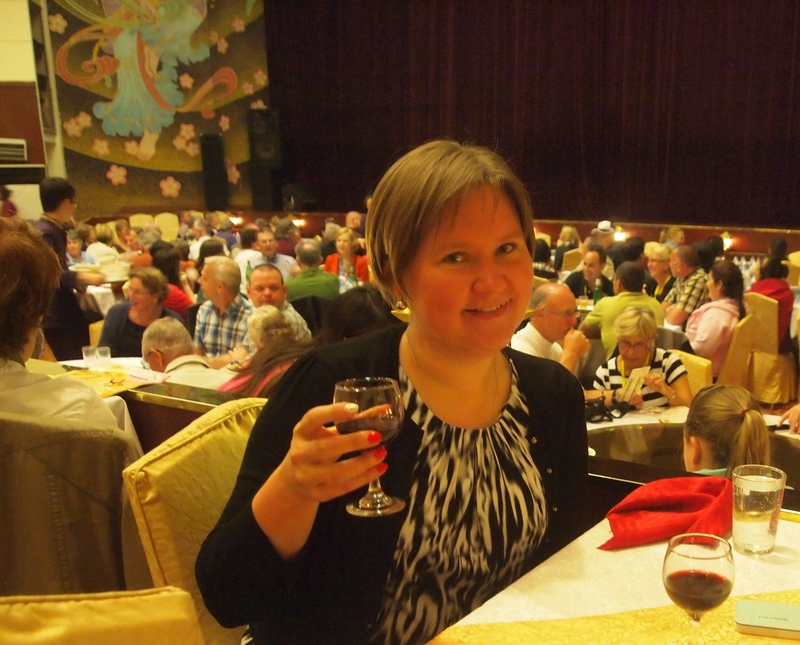 Mari and I enjoy the dumpling dishes very much, although we still feel a little hungry when all is said and done. We can’t help but feel a little rushed by the wait staff who obviously must keep the food moving along in order to clean up before the performance starts. 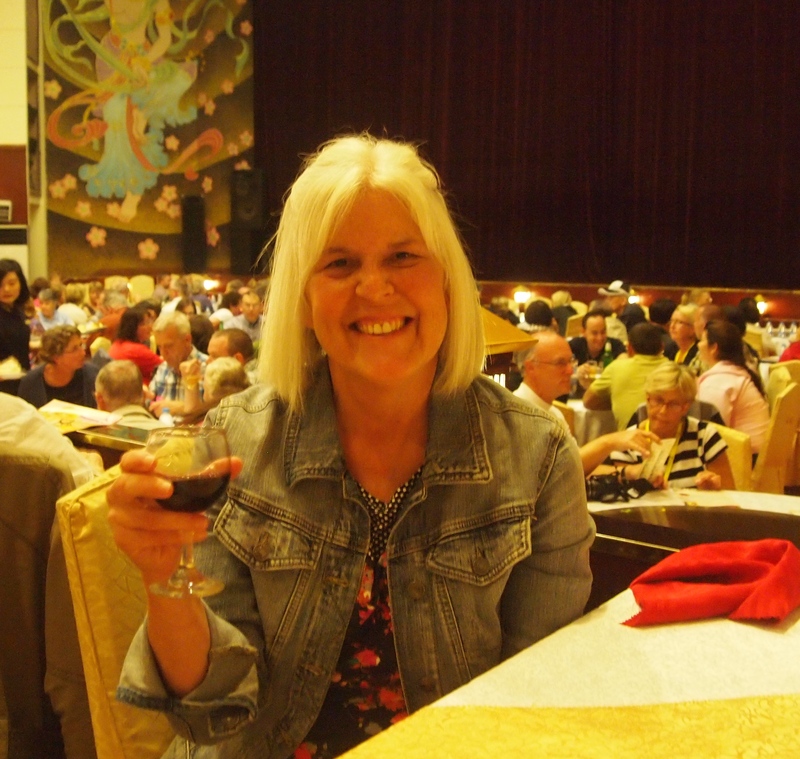 We have bought a bottle of red wine to share; luckily, we can enjoy our drinks throughout the performance. Mari from Finland. She lives and works in Beihai. 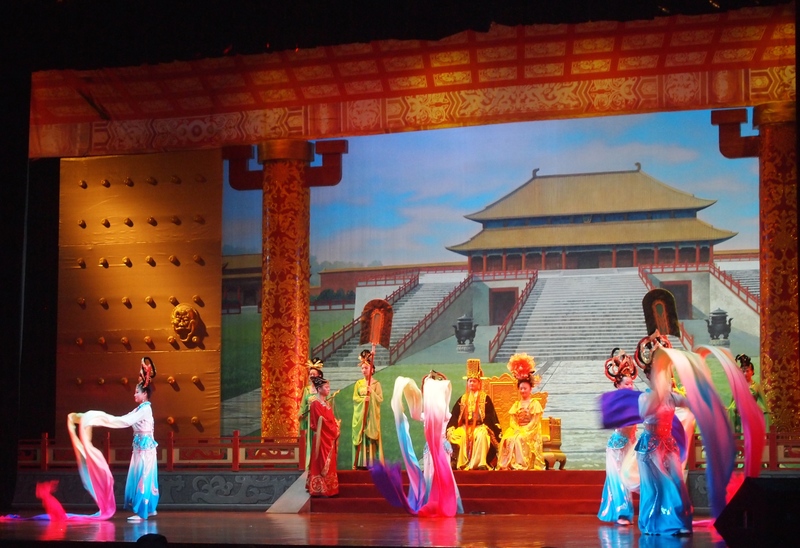 The performance is composed of ancient music and dance. 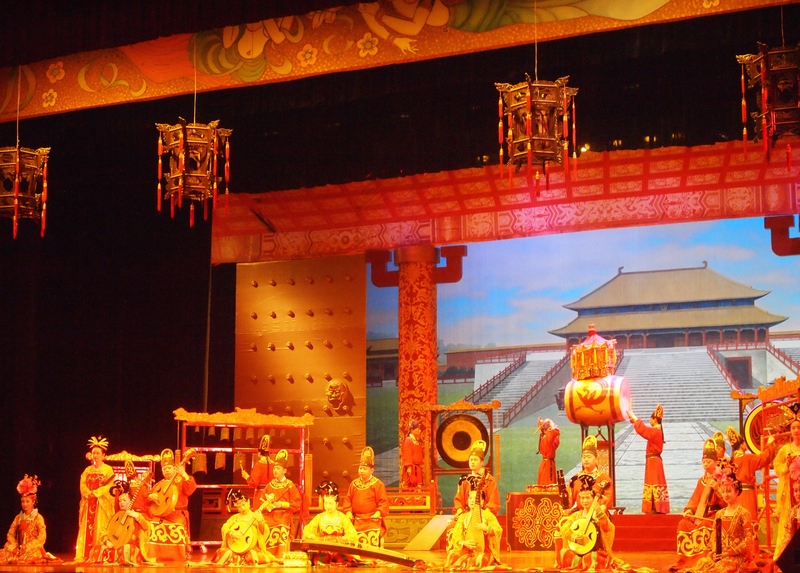 The city of Xi’an, formerly known as Chang’an, was the imperial capital during 13 dynastic periods. 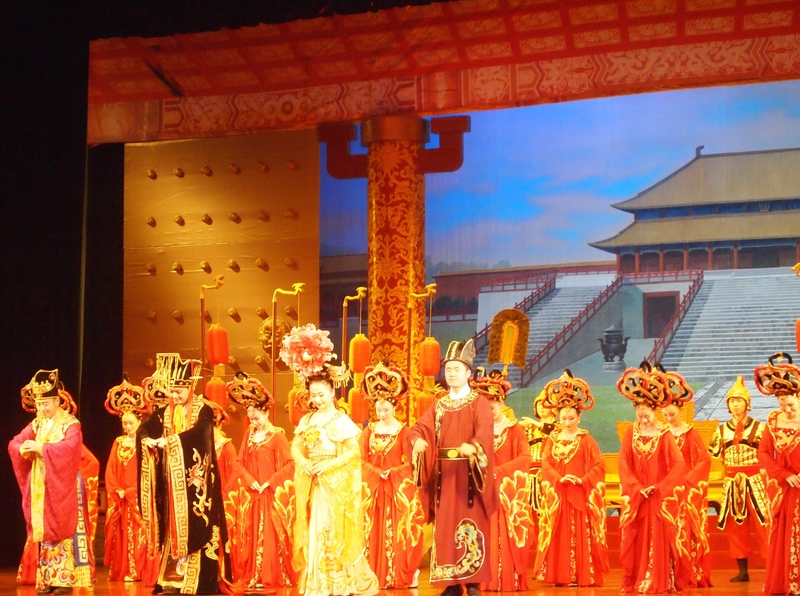 Of these, the Tang Dynasty (618 – 907) was the most sophisticated of all. 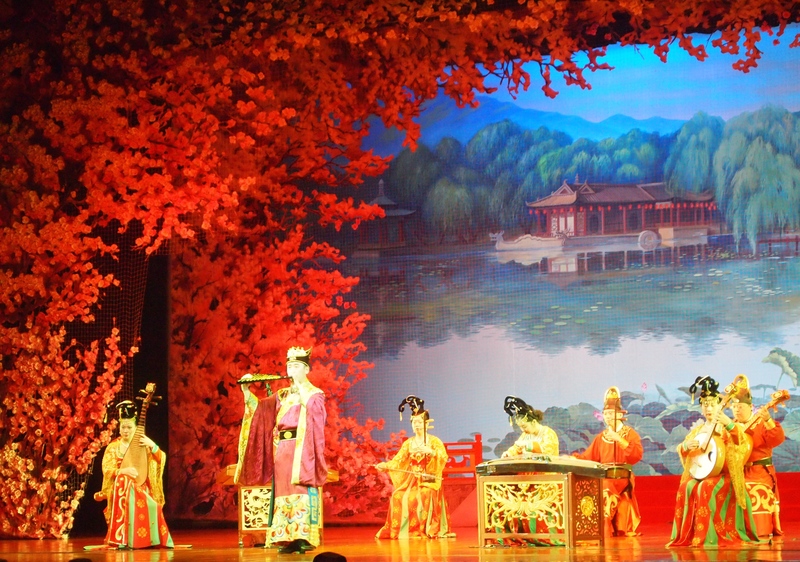 The Tang Dynasty Music and Dance Show showcases this prosperous and peaceful ancient society (TravelChinaGuide: The Tang Dynasty Palace (Tang Yue Gong)). 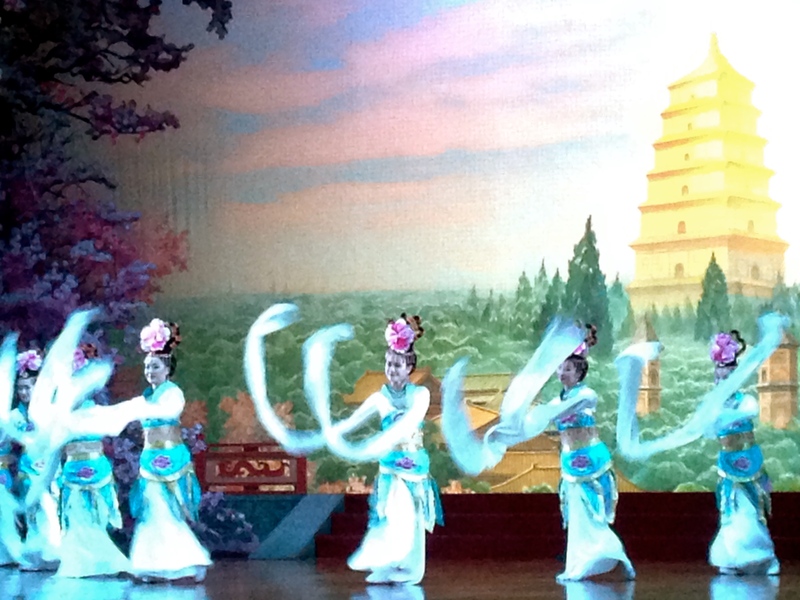 These folk dances were originally performed as prayer rituals for a good harvest or a prosperous life. 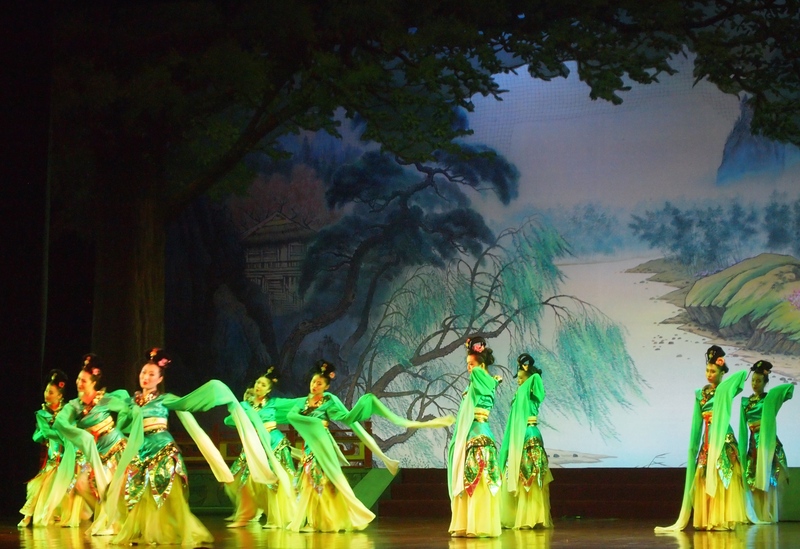 Over thousands of years, the dances developed from a few simple postures or gestures into whimsical and elegant performances, reaching a peak during the Tang Dynasty. 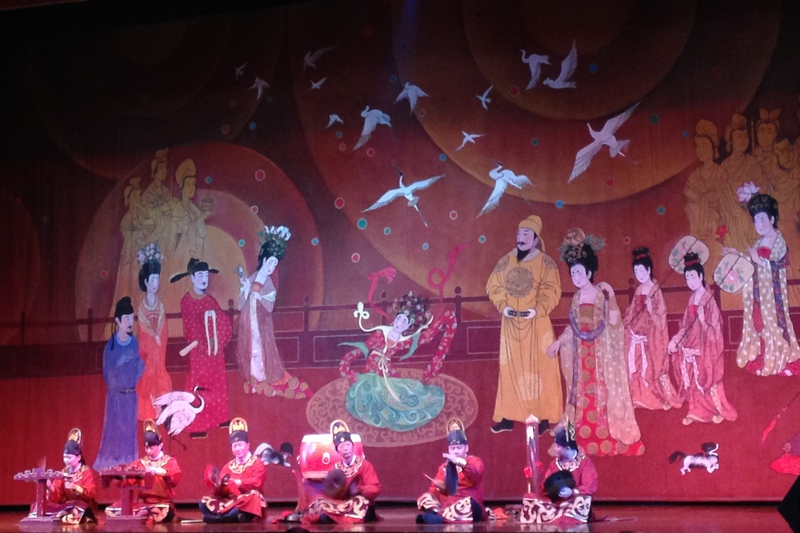 Unlike some other regimes, the Tang was open to outside influences and was willing embrace the best of various art forms, not only from past dynasties but also from ethnic groups in northwestern China as well as central and western Asia. 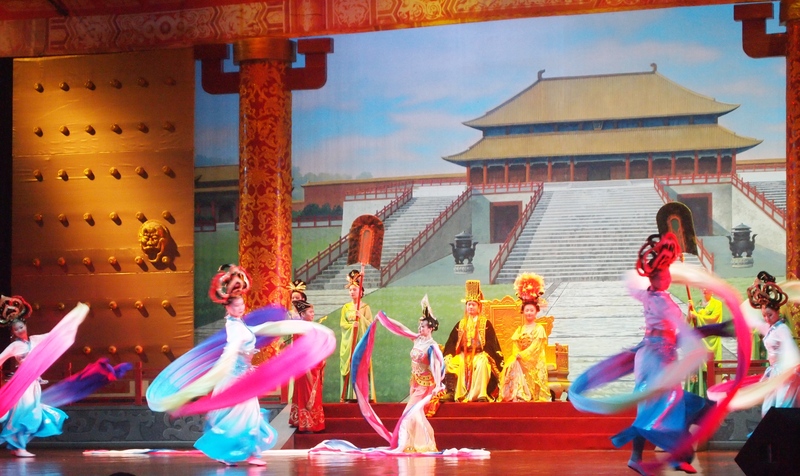 By combining poetry and stunning costumes with singing, dancing and the skillful playing of musical instruments, the modern presentation immerses viewers into ancient China’s history, brilliant arts, distinct traditions and customs (TravelChinaGuide: The Tang Dynasty Palace (Tang Yue Gong)). 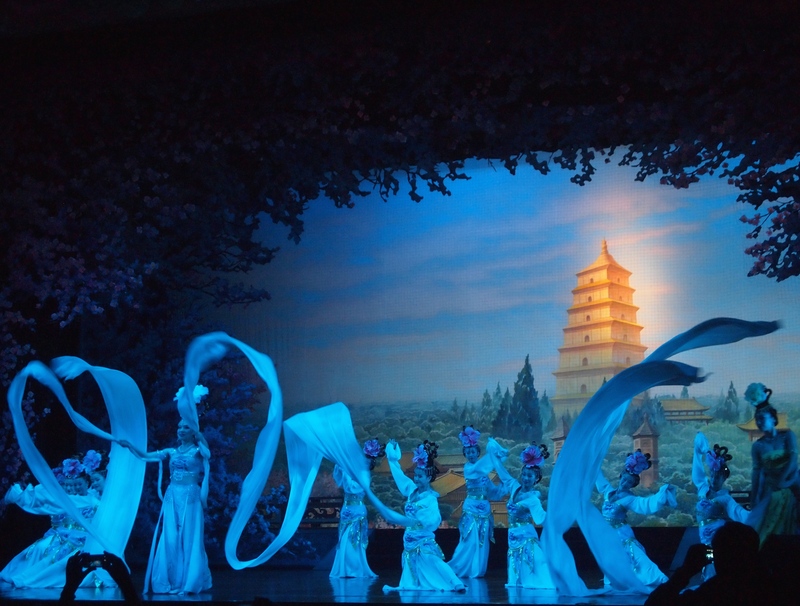 I’m especially mesmerized by the enchanting stage sets and the long and elegant sleeves of the dancers’ costumes, which float dreamily and hypnotically throughout every dance. The night’s performance is charming and vibrant, and it’s especially enjoyable having Mari’s company. We part ways after exchanging numbers and WeChat information, with promises to meet at some later date in her hometown of Beihai. You must have enjoyed that so much, Kat. One thing though, I hate being rushed when I’m eating and drinking. But I suppose they have to do it. Those pictures were surprisingly good. I find it hard to get pictures of a stage mostly because it’s so far away! You’re doing a great job of seeing and doing things. You should be proud of yourself for keeping the adventure going and trying out new things with new friends. Haha, thanks Gilly. You’re cute! Cathy, your photos are so lovely. You captured the movement and colour perfectly. It was really lovely Jo! And you’re like me, I could have been happy with just the wine! Actually it’s 3 more weekends including this one. I just arrived for one last time at the rice terraces after a 7 hour journey! 3? I can’t even count. Better not give me any of that wine 🙂 Have a great trip!